Unfortunately, Americans have some of the worst diets in the world, and everyone else knows it. With the average American consuming 24 lbs of artificial sweeteners, 29 lbs of french fries, and over 600 lbs of dairy per year, Americans are in a state of crisis. The average American diet is heavily responsible for the escalating obesity rates and is ultimately contributing to the development of illness and diseases. According to the below infographic, the average American consumes about 1 gallon of soda per week, which equates to more than 18 fluid ounces, or 1.5 sodas per day. These sodas are loaded with sugar, with a 12oz can containing 35-45 grams – an amount that exceeds the recommended daily intake of ~15 grams. What’s more, these sugars are typically in the form of high-fructose corn syrup, one of the cheapest, and most health-hazardous forms of sugar that can be used. Another concerning number in the average American diet is the amount of artificial sweeteners consumed; this includes substances like aspartame, Splenda, Sweet N’ Low, and Equal. None of these artificial sweeteners are healthful, and are even having a negative impact on your health. The worst part? You may be consuming these sweeteners every single day without even realizing it. One study found that 67% of female rats exposed to aspartame developed tumors roughly the size of golf balls or larger. Is Splenda safe? This toxic sweetener also has many dangers. Some effects associated with Splenda are shortness of breath, joint pains, eye irritation, swelling of facial muscles, ski breaking out into hives or rashes, and more. Saccharin, best known as Sweet ‘N Low has been shown to have carcinogenic links. During the 1960’s, studies on rats indicated saccharin was related to bladder cancer, but the FDA has allowed saccharin to remain as a food additive. Needless to say, there are many more problems associated with the average American diet. While consumption of food shown in weight (as the inforgraphic shows) isn’t the absolute best way to pinpoint the issues with any diet, the numbers do give us a representation and idea of how much we’re eating. If you want to compare generalizations between nations around the world, take a look at what the world eats – it’s great to have a visual concept. 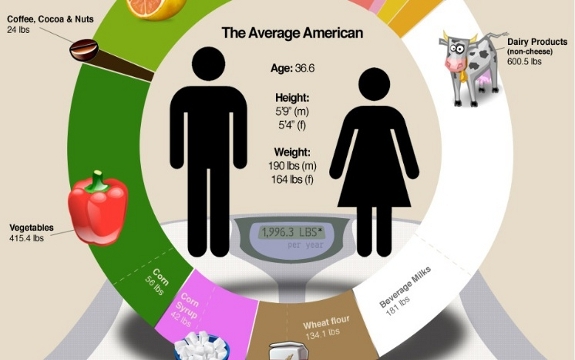 Check out the infographic below for some startling statistics on the average American diet. (Click to enlarge). Even a “Medium” order of French fries is now huge at McD. That's just pathetic. Linking to what is essentially a blog, that is blatantly self advertising all over it's web-page, with no scientific research or citations and even less credibility. The bile on that web-site is almost as appalling as your pathetic naivete/ glaring lack of conscience, as the case might be. Your intentionally vague warning against saccharin-based artificial sweeteners have been thoroughly and methodically debunked for more than 15 years, which is why all prohibitions and labeling guidelines relating to its use were removed – 12 years ago. If you're a rat and consume 2,500 times the normal equivalent human intake, yes, you need to worry. But the metabolic mechanism in rats which results in cancer is not present in humans, it's a completely different process and no study, ever, has shown any incidence or cancer – or even the suspicion of it – in humans who eat saccharin-based artificial sweeteners. Not one, anywhere, ever. Stop being silly. My friend's name is Paola! :D You guys almost have the same name! This graphic makes no sense. If cheese is not counted as a dairy product, and milk makes up less than 1/3 of the 600 pounds of dairy consumed, exactly what else is left? I rather doubt that the average American is eating 400 pounds of yogurt and creme fraiche in a year. Oh, and less pasta/rice/BREAD/beer than fruit or vegetables? The average American's diet certainly should be condemned, but these numbers do nothing but invite skepticism. 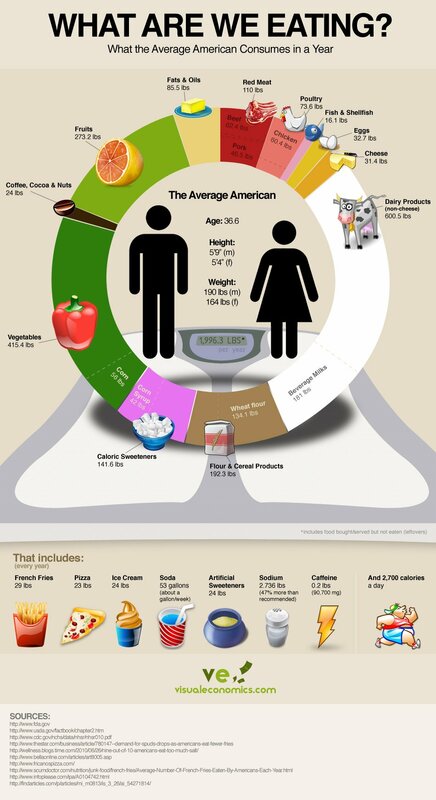 I do agree that the information in the graphic is suspect but there's a ton of hidden dairy in the American diet. Most people who aren't allergic to dairy or aren't lactose intolerant have no clue about just how much dairy is in what they eat because it doesn't cause them problems. It, also, wouldn't surprise me at all if butter and ice cream were responsible for a large chunk of the non-beverage dairy section of the graphic since butter is a common ingredient and ice cream is really popular. As for the hidden dairy, whey and other milk products are used in a ton of things you wouldn't think would ever contain dairy. Most preprocessed foods contain dairy in one form or another. anonymous you sound like you work for the dairy council, anyway i would not want to be in your family……. Corn is not a vegetable, it is a grain. Great post. I just pinned it to my pinterest page. I almost think that the soda and sweetener info is off. I think it's higher than that. I know too many people who live on those items, than complain about kidney stones and weight gain. For aspartame you are quoting a study that has been thoroughly discredited, as it was one of the shoddiest ever, done in 2005 study by the Ramazzini Foundation. The FDA requested the raw data and pathological slides, but the institute only send part of the data and denied anyone a look at the slides. The partial data still revealed various flaws. The EFSA not only looked at that study and dismissed on similar grounds, they also assembled a panel of 8 experts that reviewed over 500 studies done on aspartame. They came to the conclusion that there was no link between aspartame and cancer and that consumption within the guidelines for acceptable daily intake causes no risks to health. Maybe, but no one can deny that more Americans are finding themselves stricken with new Diseases every day. No one can deny that we are dying younger, aging faster and have more ailments from unknown substances in our environment than ever before. I say unknown because if we knew what was causing these problems, we would refrain from doing it. At least those who care for themselves, which would be most anyone reading this. We now have a much easier life than our Ancestors did. They worked harder and ate things we would throw away today. Refridgeration was not even possible not that long ago. If someone is looking out for us then why are we such a sick nation with the help of you know who. If its not in the food then where or what is it?? @Jason. The very reasons you mention as reasons we should live longer than our ancestors are the reasons we do not. Our ancestors ate what they could, when they could. Their bodies accordingly had to adapt and evolve, to develop immunity to the diseases they faced. In our dormant and over-sterilized society, we sit back and let the pills do the work for us. We coddle our young and set them up for failure. So too with our bodies. Refrigeration works to reduce wastage in our overly people infested planet, but it does not maintain levels of nutrition. Our "ancestors" had shorter field-to-plate times than we do. Barring certain veggies such as Peas (which actually fare better when IQF) we eat more canned foods, more long term refrigerated/frozen foods and far more processed foods, chemicals or not. We read labels, but most of us do not know what they mean and the food industry keeps pulling the wool over our eyes by using terminology and jargon that the bureaucracy is (either) too slow to correct (or is in cahoots with). Also, and this should be evident to you, have you SEEN how many people eat Mcdonald's or Burger King with Jumbo fries? And yet you ask because you say, "…if we knew what was causing these problems, we would refrain from doing it." I beg to differ. provides basic health care . The food was changed in the USA, UK and Australia 30 years ago when dangerous food chemicals from the USA was allowed into European. The food today causes stubborn insulin If you have stubborn insulin you hold fat and have a hard time losing weight. You can eat very little and the weight still does not come off. Stubborn insulin will hold fat and diets won’t work. When researchers used a specialized diabetes diet on overweight people all lost weight even those who did not have diabetes.